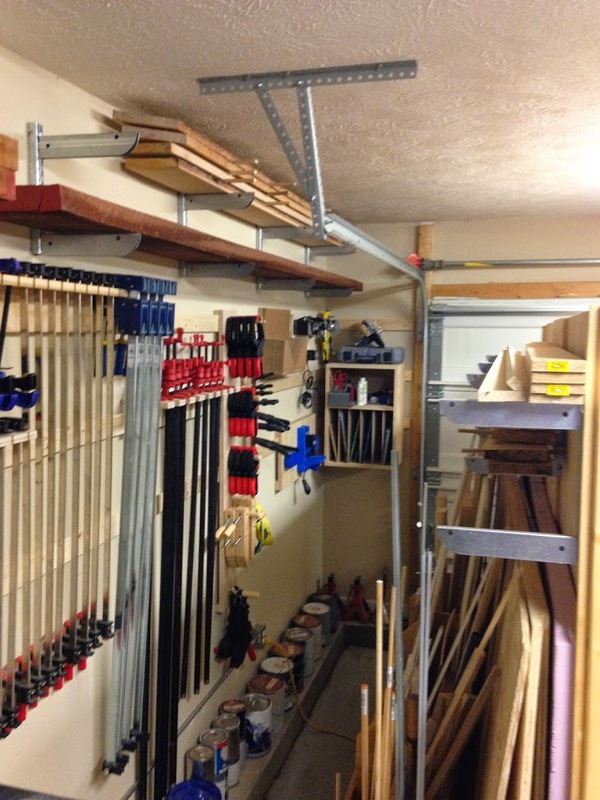 Well, Spring has come… and gone and I’ve finally finished (for now) some much needed shop cleaning and organization. Unless you have access to a ginormous building for your shop, you’ve got to find and make the most of what real estate you have. I have a 20′ x 20′ room that once was designed to hold something that can do just fine outside. That’s right folks, the paint and finish on yours and your spouses vehicle were made even designed to withstand all (ok most) of what mother nature has to offer. 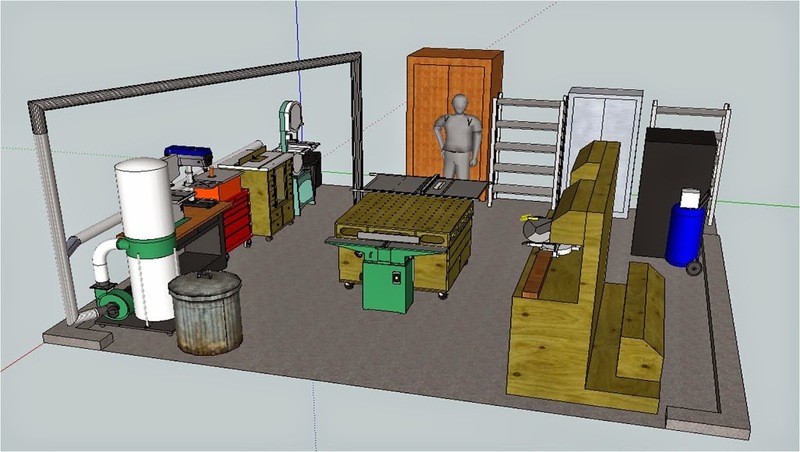 Since I live in the real work and didn’t have anywhere to put everything in my shop (formerly a garage) while I tried to figure out where I needed to put everything in a way that made some kind of order and that supported my work flow, I fired up the SketchUp machine and drew my blank canvas. The next step was to put the non-woodworking items that have to share your space in so you can see whats left for you to work with. For me it was a wooden wall locker for my Army gear, two metal shelves full of miscellaneous stuff, a garbage can, a metal wall locker full of camping gear, and my beer fridge. Now comes the hard part. You’ve got to figure out what you have (or will have if your planning a purchase in the near future) and choice the best spot for it. 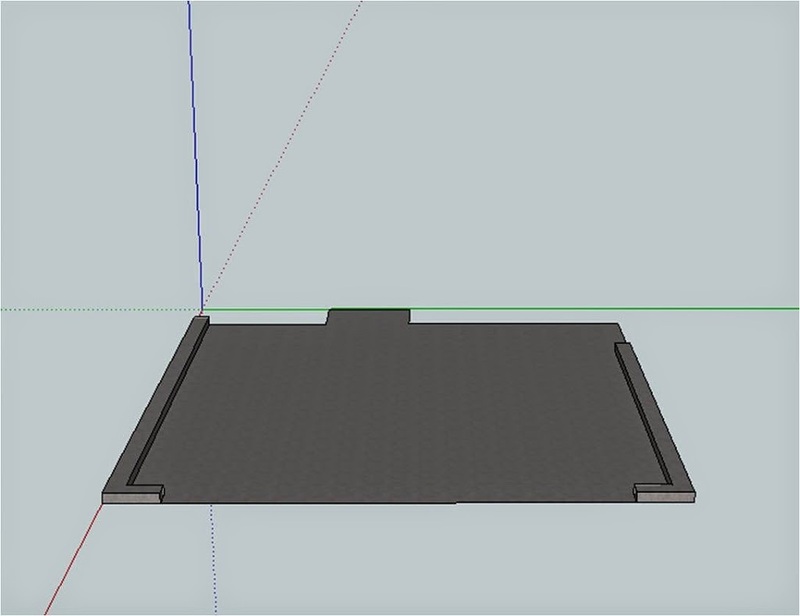 This is where using SketchUp can really help. As you place your tools in your virtual shop you can check measurements to see if you’d be able to crosscut a 8′ stick on your miter saw or if the location of your band saw stops you from being able to resaw long pieces of lumber. 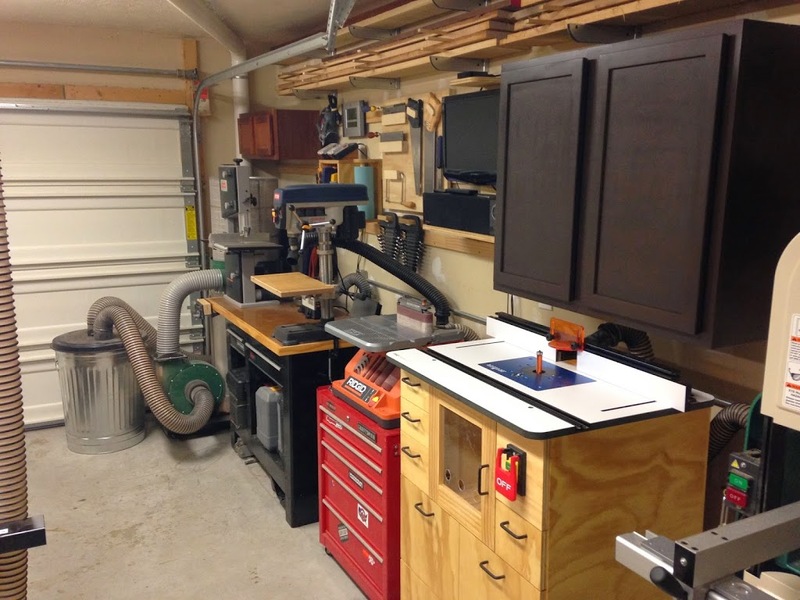 It might also be that you haven’t made some of your tool purchases yet and just want to see what you can fit in the shop space you have available. There are other resources available online for shop organization. Grizzly offers a easy to use online “Dream Shop” organizer at https://www.grizzly.com/workshopplanner. I used shop organization as a method to teach myself SketchUp. There is just about every tool ever built in SketchUp’s 3D warehouse. The other thing to keep in mind is your work flow. Now everyone is different, but what I tried to do was create some kind of flow between lumber storage to rough dimensioning to final dimensioning to making things stick to each other to finishing and everything in between. Now in my shop that isn’t a straight line. I have to have several things that do multiple tasks or that have to be moved to allow for the “next” step. With this in mind, almost everything in my shop is on casters. The other reason for this is if your like me you will “fine tune” your shop from time to time. If you think that you’ll set up your shop only once without having to make adjustments… well your a better person than me. Once I find an issue my OCD kicks in and I try to find a solution to the “problem”. 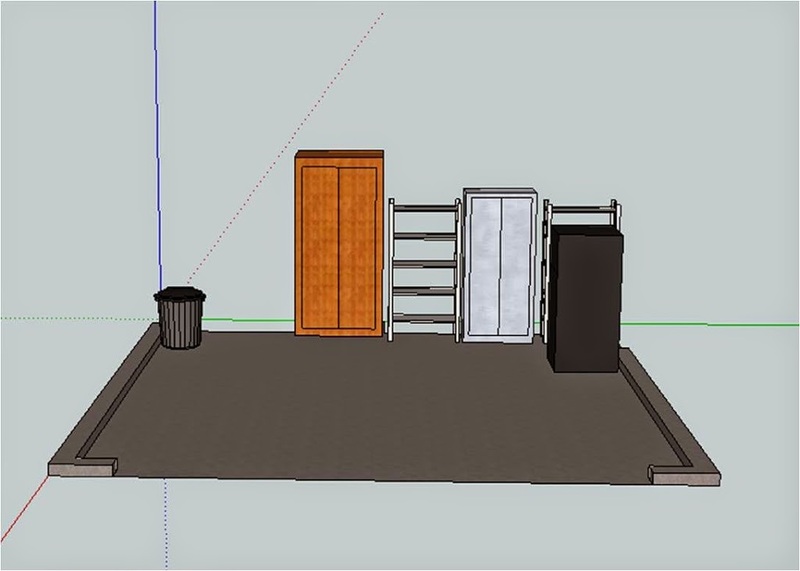 What isn’t depicted in my SketchUp is use of wall storage. 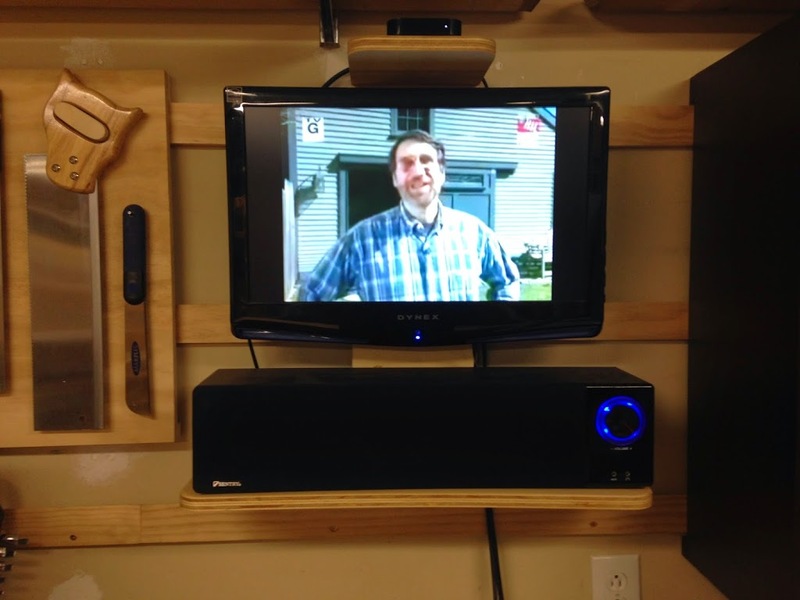 I even made a wall mount for a small TV, sound bar, and Apple TV. I mean how else is Norm going to visit my shop and help me on a project or two. There are several other things to think about in setting up or “fine tuning” your shop that maybe we can talk about another time. Issues like power, lighting and dust collection are some of the big ones that come to mind. I have also included a link to a short tour of my shop on YouTube. Please feel free to leave a comment and also check out my earlier posts. You can also visit me at Facebook , Twitter, or here on Google+.